We've had a series of frosty nights here this week, so it's hardly surprising that the main occupants of the moth trap have been Brindled Beauties in their tabby cat fur coats. 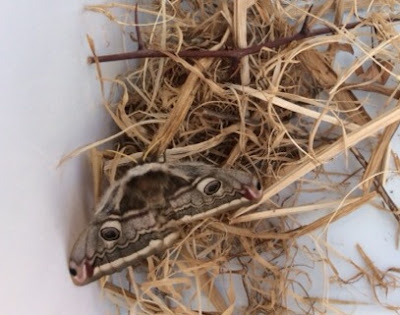 This morning there were ten in the eggboxes and one on the bulbholder, with a solitary Hebrew Character representing the rest of the moth world. 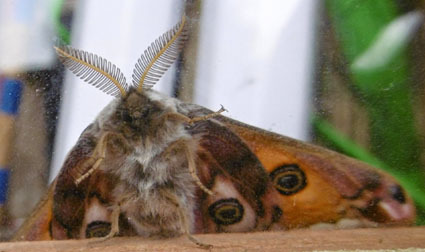 My friends up the road who are now in charge of the Emperor Moth nursery - the great-great-grandchildren of the original empress which called here in 2014 have more exciting news to pass on. They have now hatched a female - pictured below - and are hoping that she may attract some suitors to see the family onwards into its fifth generation. Meanwhile, Penny spotted this caterpillar, below, on a walk along the canal. If anyone knows what it will hatch into, please let me know too. It spent the rest of our walk happily stretched out along the magnetic strip of an old Chiltern Railways ticket.